A sudden rain storm inspires Toppie to record an impromptu moment, which leads to a search for… peepers. In the gloaming, Toppie goes in search of Spring Peepers. Toppie grabs his mic and heads to the out-of-doors to listen to the Spring Peepers. Listen as about half way through, Toppie accidentally locks himself OUTSIDE his Pickle Hallow apartment. Ummm… oops! LEFT click HERE to LISTEN to episode 269 on your computer NOW. RIGHT click HERE to Direct Download episode 269. Toppie ventures outside into the night to capture the sound of Spring Peepers. Noun 1. Spring Peeper – a small brown tree toad having a shrill call heard near wetlands of eastern United States and Canada in early spring. The Hyla crucifer tree toad – arboreal amphibians usually having adhesive disks at the tip of each toe; of southeast Asia and Australia and America. Genus Hyla – the type genus of the Hylidae; tree toads. 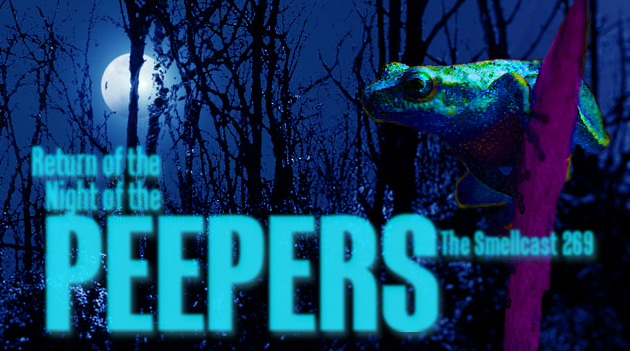 Toppie did not know that peepers are toads, not frogs (he finds this hard to believe, but what does he know? ), but he grew up hearing the creatures sing their once-a-year song until he left Podunk Junction for the big city of Rochester, NY. As heard in the Smellcast, episode 157, Toppie actually has a Zoom recorder — but truth to tell — he hasn’t yet learned how to use it. So instead, one fine Spring night just days ago, Toppie grabbed his trusty old video camera to capture a wonderful night sound-scape, switching back and forth from the camera’s condenser mic to a shot-gun mic. 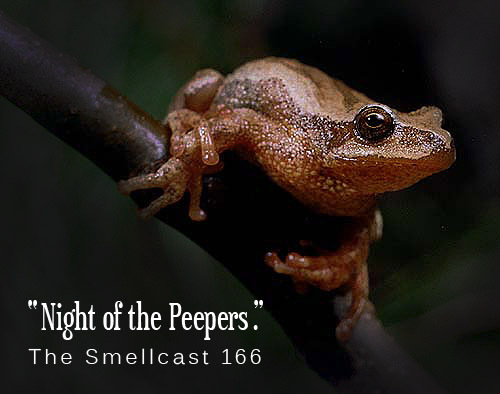 Listen for the trill of an unknown creature — likely some kind of frog (most likely not a Peeper — or maybe like the Peeper — another toad species). A goose flies by and then fade to silence. Click the link below to listen to the Smellcast, episode 166.